Wow! Are We Already There? $1,000 Per Square Foot! The photo of Joey from Friends pictured above is what I would imagine everyone’s face looking like when they read this week’s Insight Article. Let me preface this week’s article by saying that I hate starting any Insight Article by touting my own horn, but please if I may as I’m about to explain the new staggering statistic that we’re about to break. As the kids would say these days… #HumbleBrag! Rewind – Back in April 19th, 2018, I released a video called “Top 5 Most Expensive Condos in Toronto“. In case you missed it, CLICK HERE to watch the video. The message that I was trying to convey to you in that video was that condos are expensive these days, and many of the most expensive condos are well over $1,000 per square foot. The chart that I used in the video is provided again below. This chart was from December 2017. As you can see above, there were only 12 condos that broke the $1,000 per square foot mark. Additionally, as at December 2017, the average condo sold price per square foot was $847, as per below. Mind Blowing – Ladies and gentleman, we’re in September 2018 now and I’m about to knock your socks off with the following stat….. Soaring Prices – That $986 per square foot number is from Condos.ca’s real-time calculator showing the last 14 days, which coincidentally is exactly 14 days from Labour day (start of fall market) as I write this. On average, we’re almost at $1,000 per square foot in all of downtown Toronto. This includes the 25+ year old condos on Bay street. This is staggering because at the end of 2017, were we only talking about only 12 condos downtown breaking the $1,000 per square foot mark. Here we are 9 months later talking about potentially ALL downtown condos breaking $1,000 per square foot really soon! It’s happening folks! That is some rapid growth, my friends! Trending Now – For all of the buyers out there, do not be alarmed though as this is normal and was expected to begin with. This number is only going to keep increasing. Unless somebody actually addresses the condo supply issue, we will continue to see this upward trend. There are many upcoming projects in the downtown core that are all being priced at over $1,000 per square foot. 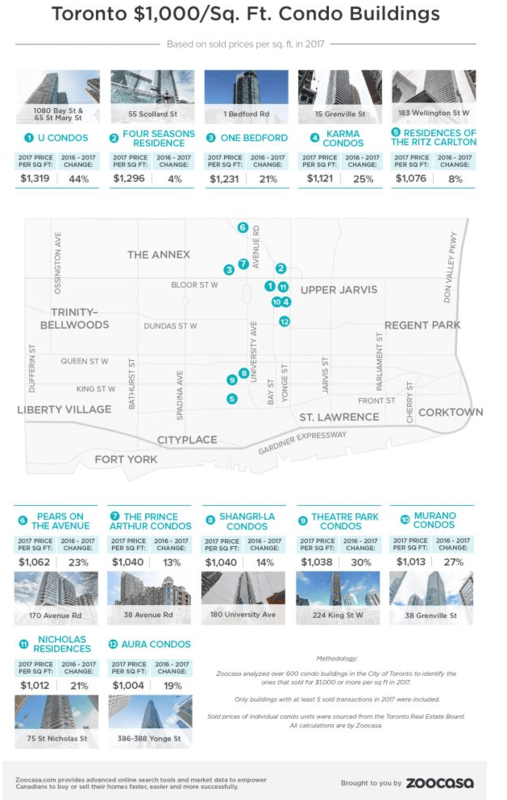 These developers pay thousands of dollars to consulting firms in order to determine their pricing model, and if their conclusion is to start pricing at $1,100 or even higher, that is likely a trend we will be seeing in the downtown Toronto resale market very soon. King West 2.0 – If you are part of PPTO’s VIP mailing list, you would have seen this week’s note where I attended the Unzipped launch on King St West where the developers of the King West 2.0 development project brought a renowned Danish architect’s exhibit to Toronto. Bjarke Ingels is the Danish architect for the new project launching in October at 533 King St West. The inspiration for this project came from Montreal’s Habitat 67 development that was built for Expo 67. Below is what the scale model looks like. It’s architecturally stunning to say the least. Word on the Street – I’ve been told this King West 2.0 project will start at $1,600 per square foot. Yup… you read that correctly – that’s $1,600 per square foot! That means your entry level 500 square foot 1-bedroom condo is going to start at $800,000!! All of the smaller investor-friendly units are going to sell out extremely fast! If you are interested in this project, make sure you let us know as soon as possible because there are only 460 units in total! Please contact Zhen at Zhen@PrimePropertiesTO.com OR 416 436 9436. The Wrap – As a City, we keep pushing the boundaries. The market is still as strong as ever in the downtown core. I sound like a broken record, but I’ll keep saying it over and over again to those who still believe the bubble is about to burst – with all of the factors impacting the market in today’s economy, all signs point to much more growth in the weeks, months and years to come. P.S., Uber just announced a $200 million dollar acquisition, which means that 300 more jobs will be located in downtown Toronto. This is in addition to all of the major companies who will be moving into the downtown core. Growth! Previous Previous post: Ontario Build-able Land SCARCITY!